Control flow testing is a testing technique that comes under white box testing. The aim of this technique is to determine the execution order of statements or instructions of the program through a control structure. The control structure of a program is used to develop a test case for the program. In this technique, a particular part of a large program is selected by the tester to set the testing path. It is mostly used in unit testing. Test cases represented by the control graph of the program. Control Flow Graph is formed from the node, edge, decision node, junction node to specify all possible execution path. Nodes in the control flow graph are used to create a path of procedures. Basically, it represents the sequence of procedures which procedure is next to come so, the tester can determine the sequence of occurrence of procedures. We can see below in example the first node represent the start procedure and the next procedure is to assign the value of n after assigning the value there is decision node to decide next node of procedure as per the value of n if it is 18 or more than 18 so Eligible procedure will execute otherwise if it is less than 18 Not Eligible procedure executes. The next node is the junction node, and the last node is stop node to stop the procedure. Edge in control flow graph is used to link the direction of nodes. We can see below in example all arrows are used to link the nodes in an appropriate direction. Decision node in the control flow graph is used to decide next node of procedure as per the value. We can see below in example decision node decide next node of procedure as per the value of n if it is 18 or more than 18 so Eligible procedure will execute otherwise if it is less than 18, Not Eligible procedure executes. Junction node in control flow graph is the point where at least three links meet. The above example shows eligibility criteria of age for voting where if age is 18 or more than 18 so print message "You are eligible for voting" if it is less than 18 then print "You are not eligible for voting." Program for this scenario is written above, and the control flow graph is designed for the testing purpose. 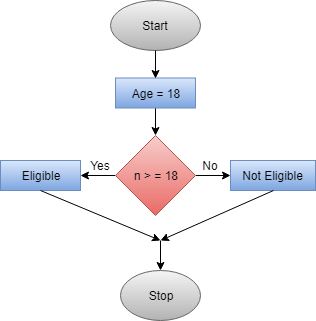 In the control flow graph, start, age, eligible, not eligible and stop are the nodes, n>=18 is a decision node to decide which part (if or else) will execute as per the given value. Connectivity of the eligible node and not eligible node is there on the stop node. Test cases are designed through the flow graph of the programs to determine the execution path is correct or not. All nodes, junction, edges, and decision are the essential parts to design test cases.